A New York Times bestseller with over a half-million copies in print, CHOCOLATE continues to delight chocoholics everywhere. 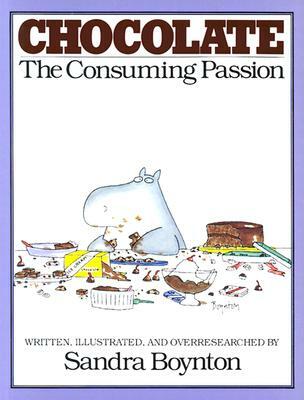 Packed with Boynton's famous hippos, bunnies, pigs, and other animals, this gift-perfect book is a whimsical commentary on the individual's relationship to chocolate, its varieties, and its sources. From the several sorts of chocolate connoisseur-including the gourmoo, who eats only milk chocolate-to the several shapes of chocolate itself (bunny, kiss, glove compartment bar), Boynton's apologia for chocolate misses nothing. Myths are debunked: chocolate is not fattening, she argues, especially when the caloric expenditure of carrying it home from the store and hiding it from company is factored in. Directions are supplied: to remove stains, lick them. Plus, how to grow chocolate at home, a foolproof method for determining if chocolate is in season (does the name of the month contain the letter A, E, or U? ), and a recipe for Hippo Pot de Mousse. "Fourteen out of ten people like chocolate," says the artist. This is the only guide for people who like chocolate the way they like to breathe. Vanilla people, keep out. Selection of the Literary Guild. Sandra Boynton is a popular American cartoonist, writer, and songwriter. Since 1974, Boynton has written and illustrated over fifty children’s books and seven general audience books, including five New York Times bestsellers. More than 60 million of her books have been sold—“mostly to friends and family,” she says. She has also written and produced five albums of award-winning children’s music. Three of her albums have been certified Gold, and Philadelphia Chickens, nominated for a Grammy, has gone Platinum. She lives with her family on a farm in New England.